Ryan Gosling plays astronaut Neil Armstrong in Damien Chazelle's new film, First Man. Chazelle, whose previous films include La La Land and Whiplash, describes Armstrong's story as one of "dreams — and the cost of pursuing those dreams." He notes that in the years leading up to the moon landing, Armstrong and his wife had dealt with the death of their young daughter, as well as the loss of several friends who had died in the space program. "The more I learned about Neil, the more I saw this story as a story about coping and about grief and about how to get over — or how impossible it is to get over — certain kinds of losses and certain kinds of emotions," Chazelle says. "Here's a guy who didn't emote overtly very much, but in many ways, I think it was those feelings that he tried to tuck underneath that drove him to the moon." It's astonishing enough that human beings have ever walked on the moon, but that they did it over 50 years ago with the technology that they had. These capsules were not really reassuring to look at when you're about to get into them. They're tiny. They're rickety. They ... are totally kind of analog. Often they feel more like extensions of the Machine Age than the Space Age. They feel like things that you would expect out of a World War II submarine or tank movie, and very much the opposite of how at least my generation grew up thinking about space travel, which was high-tech. ... Really, this was a time where we were being thrust into the future before the future arrived, and I just find that fascinating. You have a group of people literally making it up as they go along, figuring out how to get there. I think what was interesting about the Gemini 8 mission was, on the one hand, you have this incredible accomplishment of two vehicles docking in space — without that accomplishment, the moon landing would not have been possible. So it was a necessary step, and it was the first step that America ever beat the Russians to in the entire history of the space program. The Russians had beat America on every single other juncture beforehand. That was just one of many instances of, I guess, what I would qualify as near-failures or, in certain cases, failures that led the way to the success story of the moon landing. So, I think [I'm] trying to remind audiences how fragile this all was, how dangerous, the lives it almost cost — and in some cases the lives it did cost. I think it helps us appreciate maybe just how hard-earned that final moonwalk really was. We tried to shoot it in a way where we and the actors could be experiencing some version of it. So instead of using green screen or kind of relying on digital effects to paint the picture, we used full-scale replicas of these capsules. They were exactly the same size, and all the details were exactly the same. Our [cinematographer] had a big light that was on a crane that would rotate around the capsule, simulating the sun. ... The hope was if we can feel it on set, if the camera is immediately getting a sense of the visceral reality and we're not having to rely on digital post-production effects to give that sense, then the audience is going to feel it. The actors are going to be that much more in it. The sweat you see on screen will be real. The shaking will be real. Even some of the terror will be real. The nausea will be real. And, by extension, the audience will really feel that they themselves are in that capsule, too. Trying to continually remind audiences, whether it's just with subtle things like little creaks, little groans and moans of the hardware to much louder things, like things going really haywire, to whenever possible remind them this is a piece-by-piece, hand-built, machine. [We were also] shooting it on IMAX film, shooting it often from Ryan's point of view, first person, so you get to actually feel like you're the one walking down the ladder, you're the one taking that step, you're the one first traversing the lunar surface, I think that was the key: to try to replicate history and then make you feel like you're in it in a way that you never were able to before. The controversy about the flag material in the movie is pretty much exclusively among people who hadn't seen the film. ... The moon landing was an American achievement and an incredible one — and the flag on the moon was a very important part of that, which is why we show it — we show it several times — the flag standing there on the moon, on the lunar surface. In terms of actually mapping out each beat of the mission and showing the physical sticking of the rod into the lunar soil and propping up of the flag, we made a choice, entirely an aesthetic choice, not a political one, to focus on Neil's private moments on the moon during that time. The movie is about the 10 years leading up to the lunar landing. And so we only spend about eight minutes on the lunar surface. We really wanted to spend that time to look at things that people didn't see, things people didn't know about. So what he himself would be seeing as he first emerged from the lunar module before the camera had even gone down, and then after his famous line, his unplanned walk off to the Little West crater during which point he spent time alone, away from any cameras. So that's a part of the moon walk that no one really knows about. NEIL ARMSTRONG: We're getting the picture on the TV. GROSS: That video image was being transmitted live from the moon to NASA and around the world just after the Apollo 11 Lunar Module, commanded by Neil Armstrong, became the first manned spacecraft to land on the moon. Moments later, Armstrong became the first human to walk on the moon and said these now-famous words. ARMSTRONG: That's one small step for man, one giant leap for mankind. GROSS: That was 50 years ago, when NASA didn't have the computer technology we have today. And that makes the successful moon landing even more remarkable. My guest, Damien Chazelle, directed the new movie "First Man," based on Neil Armstrong's life in the 1960s when he was an astronaut and took incredible risks to test new spacecrafts and fly to the moon. Armstrong is played by Ryan Gosling, who also starred in the movie musical "La La Land," which Chazelle wrote and directed. Chazelle won the Best Director Oscar for that film. He also wrote and directed "Whiplash." Let's start with a scene from "First Man." Astronauts Neil Armstrong, Mike Collins and Buzz Aldrin, played by Corey Stoll, are seated together at a table at a press conference in July 1969, taking questions from reporters before embarking on their Apollo 11 mission to the moon. RYAN GOSLING: (As Neil) We're planning on that flight being successful. UNIDENTIFIED ACTOR: (As reporter) I just meant how you feel about being a part of history. COREY STOLL: (As Buzz) I think I can shed some light here. It's a responsibility, but it's exciting to be the first. Even my wife is excited. She keeps slipping jewelry into my PPK. UNIDENTIFIED ACTOR: (As reporter) You're planning on taking some of her jewelry to the moon, Buzz? STOLL: (As Buzz) Sure. What fella wouldn't want to give his wife bragging rights? UNIDENTIFIED ACTOR: (As reporter) Neil, will you take anything? GOSLING: (As Neil) If I had a choice, I'd take more fuel. GROSS: Damien Chazelle, welcome back to FRESH AIR. And congratulations on "First Man." You know, my first reaction when I heard you were going to make a film about Neil Armstrong and the moonwalk was, what? GROSS: Why would someone who's so absorbed in movies and jazz and musicals make a movie about an astronaut and space? I love the film. But I was wondering, like, when you were offered the chance to make this film, how did you see yourself being the right fit with it? DAMIEN CHAZELLE: Well, you know, I, myself, I think, had the same sort of initial - you know, it didn't really line up with the sort of films I'd been making or kind of had in my mind. But I think after thinking about it for a little bit and starting to read Jim Hansen's incredible book that the movie's based on it, it struck me as a story about dreams and the cost of pursuing those dreams. And, you know, there was sort of similar thematic terrain, at least, to "Whiplash" and "La La Land," and - but just on this kind of grand, cosmic canvas. And so it seemed like if I could tell that story and tracing, you know, the sort of journey from the kind of intimate home life on the ground to the sort of extremes of human experience out in space, there could be some sort of through line that connected those. It could be really interesting. 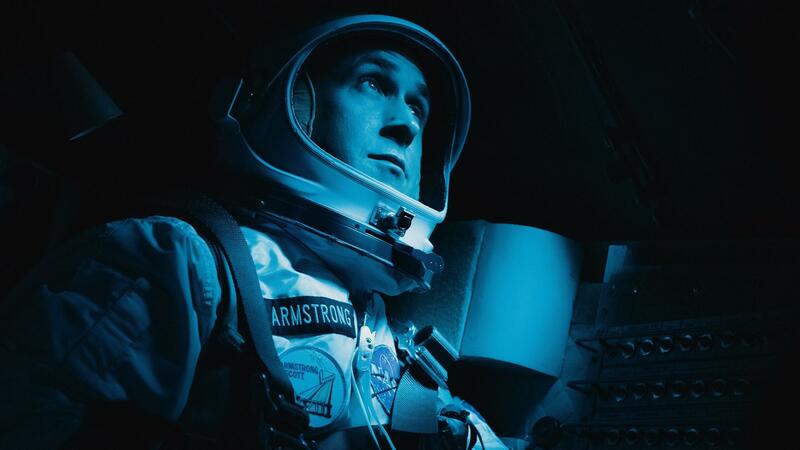 GROSS: Well, you managed to connect "First Man" to musicals in two ways. GROSS: One is that, in the film, anyways - I don't know if it was true in real life - Neil Armstrong had written lyrics for a musical in college whose title was college spelled backwards, so it was like egelloc. GROSS: ...Related to that (laughter). CHAZELLE: I would have been too self-conscious to make that up (laughter) if it weren't true. CHAZELLE: That was definitely true Neil Armstrong. GROSS: ...You slipping that in or did he like "Oklahoma?" CHAZELLE: He liked "Oklahoma." He liked - they would play "Camelot" a lot throughout the house as well, apparently. I mean, he was a big showtunes fan. He was a big kind of big band fan, big fan of the instrument the theremin, which we used a lot in the score, so lots of lots of little musical idiosyncrasies with him that I would say line up with my own. GROSS: And it just makes you wonder, like, how did they do this? How did they do this without the kind of computer and digital technology that we have today? CHAZELLE: It was - it makes it even more astonishing, I think. You know, it's astonishing enough that human beings have ever walked on the moon, but that they did it over 50 years ago with the technology that they had. You know, these capsules were not really - I would say were not kind of reassuring to look at when you're about to get into them. They're tiny. They're rickety. They, as you say, are totally kind of analog and feel - I mean, often, they feel more like extensions of the Machine Age than the Space Age. They feel like things that you would expect out of a World War II submarine or tank movie, very much the opposite, I think, of how, at least, my generation grew up thinking about space travel, which was high-tech, which was - you know, it was - everything having to do with space travel in the movies was sleek and grand and clean and just the epitome of technology. And really, this was a time where, you know, we were being thrust into the future before the future had arrived. And I just find that fascinating. You have a group of people literally making it up as they go along. GROSS: You know, an example of all the things that could possibly go wrong in the Gemini 8 flight, the - this was, like, the first - this was going to be the test of the first spacecraft to dock with another spacecraft to see if that's possible. And so, you know, Neil Armstrong's on that mission. And as he's getting strapped in to the space capsule before takeoff on this really daring and dangerous mission, they realize his seatbelt isn't working, like, the mechanism's stuck. And well, one of the members of the tech crew says, hey, does anybody have a Swiss army knife? And it just makes you think about if the seatbelt isn't working, just think about all the things that could possibly go wrong. And that's a kind of constant theme of the movie, like, all the things that could possibly go wrong and how amazing it is that any of this happened. CHAZELLE: It was one of the big things I wanted to try to get across because I think we almost take the moon landing for granted today. And maybe it's because the sort of image of NASA at that time and that we've lived with since was this sort of high-tech image you describe and this kind of image of sort of the epitome of technology and the epitome of individuals, this idea of superheroes, basically, walking among us, who did these deeds that were almost easy for them because they were just so super-heroic. And I think it's much more interesting to think of these people as ordinary human beings working with the limited technology that they had, you know, scrounging things together, figuring stuff out, fixing things with Swiss army knives, doing calculations with pencils and paper. And also, you know, the families - I think there's the whole untold story of kind of what this actually meant on a family level. And so, to me, it was really important to, you know, at every juncture be looking at Neil in conjunction with Janet Armstrong, who I was lucky to spend time with before she passed away, and talked to about this period in their life and just, you know, what that means to a marriage, what it means to a family where you're trying to raise kids. You know, in Neil's case, to, you know, literally perform, you know, for example, this Gemini 8 mission, which came this close to resulting in his death, something I didn't know about. It was a total near catastrophe in space that almost cost the lives of two astronauts and ended the program right then in the mid-'60s. And he comes home and has to, you know, take out the trash and clean the pool and help make his kids breakfast in the morning. How do you balance those two things? I think I just - I found that fascinating. GROSS: ...Like, the spacecraft that he's docked with that's causing everything to be out of control. So he undocks and then realizes, no, it's the spacecraft he's in that's out of control. And he's just kind of spinning and tumbling. And it's noisy, and it's vibrating like crazy. Can you talk about shooting that scene? Because you have several scenes where you can just experience the extremes of being in a space capsule, in this case, because it's kind of lost control, but in other cases, because you're entering or leaving Earth's atmosphere, and it's a rocky ride. So why don't you talk about the spacecraft scene after they undock? CHAZELLE: We wanted spaceflight to feel really physical in this movie, you know, and for you to feel the blood, sweat and tears, so to speak, but, of course, also those moments of awe and grandeur that surprisingly can kind of pop up. And I think what was interesting about the Gemini 8 mission was, you know, on the one hand, you have this incredible accomplishment of two vehicles docking in space. Without that accomplishment, the moon landing would not have been possible. So it was a necessary step. And it was the first step that America ever beat the Russians to in the entire history of the space program. The Russians had beat America on every single other juncture beforehand. And so you have this sort of, you know, everyone kind of feeling like royalty, as they should. And right away, you know, almost like a trick of fate, this problem you described began. And it's not just that it was this, you know, kind of immediately life-threatening issue, but also the confusion of it. And so keeping the camera inside the capsule as much as possible, not sort of cutting out to big, wide shots that would sort of overly explain things, trying to really be subjective and immersive to what Neil himself and his and his colleague, Dave Scott, would be experiencing. I think that was really important to us. And that was just one of many instances of, you know, I guess what I'd qualify as, you know, near failures, or in certain cases, failures that led the way to the success story of the moon landing. So I think trying to remind audiences how fragile this all was, how dangerous, the lives it almost cost. In some cases, the lives it did cost. You know, I think it helps us appreciate maybe just how hard-earned that final moonwalk really was. GROSS: Let me reintroduce you here. If you're just joining us, my guest is Damien Chazelle, and he directed the new movie, "First Man," about Neil Armstrong and all it took to be the first man to walk on the moon. He also wrote and directed "La La Land" and "Whiplash." We'll be right back. This is FRESH AIR. GROSS: This is FRESH AIR. And if you're just joining us, my guest is Damien Chazelle, who directed the new movie, "First Man," about Neil Armstrong, the space program in the '60s and Armstrong's walk on the moon. He was the first man to walk on the moon. And Damien Chazelle also wrote and directed "La La Land" and "Whiplash." What did you have to experience yourself in order to convey the experience of being in a spacecraft that's out of control? Did you do any simulation exercises just so you can viscerally experience it and therefore portray it? CHAZELLE: Well, we tried to shoot it in a way where we and the actors could be experiencing some version of it, you know? So instead of using green screen or kind of relying on digital effects to sort of paint the picture, we used full-scale replicas of these capsules that were, you know, sort of exactly the same size. All the details were exactly the same. Our production designer, Nathan Crowley, did an incredible job sort of rebuilding these things. And we'd - we would mount the - you know, we wouldn't fly them into space. But we would mount them on motion control systems, gimbals, that basically would move and rock back and forth quite violently if we needed them to. And we would set those up against giant LED screens. So it was kind of like being in a simulator ride. You sort of sit inside them. And everything - you can't see off the set. You look out the window. You see space imagery instead of, you know, film equipment or crew or a green screen that we'll fill in later. You see the Earth spinning by over and over again. You know, our DP had a kind of big light that was sort of on a crane that would rotate around the capsule, simulating the sun. So you'd get this kind of strobe, you know, meets sort of rocking-back-and-forth meets sort of inner-vibrations meets kind of everything-going-haywire sort of experience for the actors and for, you know, thereby the cameras inside - inside the crafts. I mean, the hope was to really, you know - was kind of feeling, if we can feel it on set - if the camera is really immediately getting a sense of the visceral reality and we're not having to rely on digital post-production effects to give that sense, then the audience is going to feel it. The actors are going to be that much more in it. You know, the sweat you see on screen will be real. The shaking will be real. Even some of the terror will be real. The nausea will be real. And by extension, the audience will really feel that they themselves are in that capsule too. GROSS: So let me get this straight. So Ryan Gosling is in this capsule that you are violently shaking so that it looks real and so that he's really experiencing all of the disorientation and just physical jostling of all of this. CHAZELLE: Yes. You know, we didn't literally spin Ryan in the capsule at, you know, several rotations per second, as happened to Neil and Dave Scott, you know (laughter). But we - Ryan and I both wanted to try to make it as physical as possible and experiential as possible. GROSS: Did anybody throw up? It's an important question. (Laughter). CHAZELLE: We had to take - we had to take a moment. No, it got us actually all very worried for a second 'cause Ryan's the type of actor who really just, you know, really wants to do as much of it himself as he can. So I think we all had to kind of intervene at a certain point and go, you know what? We should - we should give you a rest and, you know, have you checked out. And we'll shoot other stuff for a little bit. Turned out he was fine. But I think it's a testament to Ryan that if it were up to him, I think he would have just kept on shooting. GROSS: Another thing that adds to the whole experience of seeing this is the noise. I mean, you're hearing alarms go off. You're hearing banging. And you think of space as being very quiet. But I guess at times like this, it is not quiet at all inside the space capsule - or at least it wasn't then. So can you talk a little bit about the sound design for scenes like the one we've been talking about? CHAZELLE: Yeah. Well, I mean, I think one of the great opportunities with putting space in film is actually how you can play with sound. You can play with the silence of space itself, that kind of, you know, soul-sucking void, you know, that is space in juxtaposition with just the crazy kind of noise-making machinery that these capsules were. Again, these weren't the kind of clean sort of - you know, this isn't hyperspeed kind of beam-me-up-Scotty space. This is - this is creaking machinery kind of making its way up there. So something like a - like the spin sequence we were talking about - you know, certainly we wanted to kind of try to hit at an emotional reality for that in the sense that we sort of would augment the sounds you'd actually hear with, you know, sounds that would kind of hopefully help the audience really immerse themselves in the experience. You know, you want to go that extra mile. But I also think kind of trying to continually remind audiences, whether it's just with subtle things, like little creeks, little groans and moans of the - of the hardware, to much louder things, like things really going haywire, to just whenever possible, remind them that this is a piece-by-piece, hand-built machine. This is not something that - you know, these spacecrafts aren't something that are just delivered from the future. You know, they're pieced together by rivets, by wire, and often they would sound like that. GROSS: You know, a moment that stands out in my mind from the film is right before the moon flight, NASA puts together a press statement about the deaths of the men on the flight because they are planning for a possible catastrophe. And so, you know, they're basically sending these astronauts off into space, hoping they land on the moon, but if they don't - just in case they don't - NASA is preparing, you know, basically a eulogy - a press release eulogy. Did that actually happen? CHAZELLE: Yeah. Yeah. I mean, you can find the - you know, you can search it online. In event of moon disaster, was sort of the - you know, the, sort of, heading on the copy. And so the sheet of paper you see Ciaran Hinds, who plays Bob Gilruth in the movie, holding is pretty closely modeled after, you know, the actual, sort of, formatting and paper that you can - again, that you can find online. And the wording is word for word. And it's a really - I mean, it's - I actually really love that speech because - you know, thank God it was never given. But in a way, it encapsulates, in such a poetic, beautiful way, the willingness to sacrifice and this kind of reminder of the greater goals of all of it. You know, there's a line in the speech that says, basically, from now on, anyone who looks up at the moon will know that there is some part of another world that is forever mankind. And there's just a - you know, obviously, a combination of tragedy in reading that, knowing what the intent of that speech was, but yet also, at the same time, this incredible kind of hope and this sort of unifying kind of outlook on what space travel could do, you know, and what these sort of risky, costly, brave ventures could maybe do for the country and for humanity. GROSS: I was wondering if the astronauts knew - if Neil Armstrong knew that NASA was writing his obituary, just in case? CHAZELLE: You know, I don't know that for sure. I think, you know, one fascinating thing about Neil and his colleagues was just how close to death they lived their lives and seemed willing to live their lives. And it's also not a conversation that's unique to test pilots or astronauts. You know, it's something that families all over the country and all over the world - conversations that they sometimes have to have. Any sort of service for country often involves, you know, at least that risk. And it's something I think is helpful to remind people of. GROSS: My guest is Damien Chazelle. He directed the new film "First Man" and wrote and directed "La La Land" and "Whiplash." We'll talk more after a break. And Lloyd Schwartz will review a new set of Yo-Yo Ma's recordings of Bach cello suites. I'm Terry Gross, and this is FRESH AIR. GROSS: This is FRESH AIR. I'm Terry Gross, back with Damien Chazelle. He wrote and directed "Whiplash" and "La La Land," and he directed the new film "First Man," starring Ryan Gosling as Neil Armstrong, the astronaut who commanded the Apollo 11, the first manned spacecraft to land on the moon. On July 20, 1969, Armstrong became the first human to walk on the moon. Now, you mentioned you had the chance to talk with Janet Armstrong, who was Neil Armstrong's wife. They were married, I think, for 36 years and then divorced. What were some of the things you learned from her that help you understand what she - and she's portrayed by Claire Foy - and what Armstrong were going through during this period in the '60s when he was an astronaut? CHAZELLE: Well, one thing, I think, that Neil and Janet had in common was this ability to put on a face in moments of incredible, you know, upheaval. You know, they were able - you know, it was something in their character - the sort of, you know, Midwestern kind of grit that they had that also, you know, was very much a product of their time and their culture - that was just able to do the impossible without complaint. And, you know, I really got a vivid sense of that when talking to Janet, you know. I would ask her things, like - you know, well, how did you - how did you do this? How did you feel when, you know, you're moving from place to place? You know, say you're moving from Juniper Hills in California, where - when they first moved there for Neil to be a, you know, test pilot with the X-15, he's working an incredibly dangerous job. They're living in a cabin with no running water, no electricity and in the middle of nowhere. Then they move to Houston, after, you know, after suffering a grievous loss as a family. And, you know, again, Neil is working a dangerous job and away 80 percent of the time. And who knows if he'll ever return? I mean, just, you know, how did you cope? And she would several times just look at me and almost with a shrug say, well, sink or swim. That really stuck with me just that it was as simple as that, in a way - but, of course, as complicated as that. And, you know, so she vividly remembered so many of, you know, the kind of day-by-day activities and instances that we depict in the movie. And a lot of it was even down to, you know, lines of dialogue to quite emotional moments in the movie, for example, when - when Janet, you know, late in the film insists to her husband that he sit down and tell his kids before he goes off on his moon mission - sits down and tells them that he may not return. GROSS: She made him do that in real life? CHAZELLE: Yeah, yeah, this is all - he made a lot - this was - is already recorded in Jim Hansen's book. But getting to actually talk with her about it and talk through what that conversation actually was - and then what the ensuing dinner table conversation actually was. I mean, a lot of that scene in the movie is taken verbatim from what she recollected and from what her sons, Rick and Mark, who were incredibly helpful through the whole process of the movie, recollected. GROSS: Yeah, and in the scene you're talking about - and apparently in real life, too - Neil Armstrong didn't really want to have that conversation with his sons, saying, like, I might not make it back. But she demanded that he has to do it and that she wasn't going to do it. He has to do it. And he does but in this incredible, like, low-key way, without really - without really showing emotion. CHAZELLE: Yeah, I mean, I think for Neil in particular - but it applies to both of them - in order to, you know, the only way you get through something like a mission like that, or - or - you know, for example, through some of the losses that they experienced as a family, the only way you can get through - or at least the only way they felt they could get through was by trying as hard as possible to hold those emotions in check. But that's sometimes a difficult thing to do. You know, and I think - I think Neil in the movie, and I think, you know, in real life to a certain extent, was someone who I think was more afraid of engaging with those emotions and actually sitting down and facing them, you know, and talking to people about them than he was hurling himself through the atmosphere and flying into the void of space. You know, he was a man without any fear. They were a married couple without any fear, except for this sort of deep gnawing fear that I think they constantly had to deal with day by day on the ground. GROSS: So Justin Hurwitz did the score for the film. And you also worked with him on "Whiplash" and "La La Land." You met in college. And I think the music is really good for the film. And I know music's very important to you. During the moon landing sequence, there's music that sounds to me like part-military, part, like, Western theme music. And, you know, "Star Trek" referred to space as the final frontier. (Laughter). GROSS: So I was wondering if that was intentional, to have a kind of Western edge to it because the rhythm sounds part military and part kind of galloping, like horses in a Western. GROSS: These are the intercoms, is that - when you say the comms? CHAZELLE: Yeah, sorry, yeah - when, you know, the actual audio between the capsule and CapCom and Mission Control and whatnot. You know, you can listen to all of that in real time. You know, you can listen to all of it online. And it's just this - you know, there was sort of one thing after another that went wrong or almost went wrong. And - but I get the sense that Neil was going to - was going to land that thing and wasn't going to be stopped. And, you know, everyone had come too far at that point to turn around. And, you know, so when you learn things, like the fact that they landed with, you know, only 2 percent of, you know, gas remaining, they landed within the 30-second window, by which point they would have had to do a mandatory abort, you know, or - or else basically die - you know, those are things that I didn't really know about when I first thought about the moon landing. And, you know, so it felt like, music-wise, if we could get into Neil's mindspace, if we could get into that sense of just a relentless, unstopping drive, it would - it would befit the scene. GROSS: OK, let's hear some of that music. This is moon landing music from the score for "First Man." GROSS: That's moon landing music from Justin Hurwitz's score for "First Man," a new movie about Neil Armstrong and his various space missions and then landing on the moon and becoming the first man to walk on the moon. My guest, Damien Chazelle, directed the movie. He also directed "La La Land" and "Whiplash." The thing that your film has become controversial for in some circles is that you didn't show Neil Armstrong planting the flag on the moon which is, you know, a famous moment that was relayed, you know, in real time on camera from the moon. This is an excerpt of a transcript from what President Trump said to the conservative publication The Daily Caller. This was from September 4. The interviewer asked for Trump's thoughts on the fact that the planting of the flag was not shown. And he was asked, do you think that's upsetting? And Trump says, I think it's very unfortunate. It's almost like they're proud of - it's almost like they're embarrassed at the achievement coming from America. I think it's a terrible thing 'cause when you think of Neil Armstrong, when you think about the landing on the moon, you think about the American flag. And I understand they don't do it. So for that reason, I wouldn't even want to watch the movie. And then he's asked, do you think other people should go see the movie? And Trump says, that's up to them. It really is. That's up to them. I don't want to get into the world of boycotts. And then he goes on to talk about Colin Kaepernick and Nike. CHAZELLE: The controversy about the flag material in the movie, you know, I think it's pretty much exclusively among people who hadn't seen the film. And I have to say I understand, very much, the emotions that something like that could arouse. I think, obviously, the moon landing was an American achievement and an incredible one, and the flag on the moon was a very important part of that, which is why we show it. We show it several times, so the flag standing there on the moon - on the lunar surface. In terms of actually, you know, mapping out each beat of the mission and mapping out, you know, and showing the, you know, the physical sticking of the rod into the lunar soil and propping up of the flag. We've made a choice - entirely an aesthetic choice, not a political one - to focus on Neil's private moments on the moon during that time, you know? The movie's about the 10 years leading up to the lunar landing, and so we only spent about eight minutes on the lunar surface. We really wanted to spend that time to look at things that people didn't see, things people didn't know about - so what he himself would be seeing as he first kind of emerged from the lunar module before the camera even gone down, and then after his famous line, his own sort of planned walk off to the Little West crater, during which point he spent time alone away from any cameras. So that's a part of the moonwalk that no one really knows about, I didn't know about before researching this. Those were the things I think that were really important to us in terms of - in terms of process of what we show, but certainly showcasing not only the American flag on the lunar surface but just the ways in which this program was a product of America and paid for entirely by American taxpayers. That was something that was incredibly important for us to show and that I think we do show and do justice to throughout the movie. GROSS: My guest is Damien Chazelle. He directed the new movie "First Man" and wrote and directed "La La Land" and "Whiplash." We'll talk more after a break. This is FRESH AIR. GROSS: This is FRESH AIR. Let's get back to my interview with Damien Chazelle. He wrote and directed "La La Land" and "Whiplash" and directed the new movie, "First Man" starring Ryan Gosling as Neil Armstrong, the first human to walk on the moon. I want to ask you about the music that Neil Armstrong plays on the moon, and I think it's the music he actually brought with him to play after the space landing. Am I right about that? CHAZELLE: This is music he plays on the way to the moon - I think is what you're referring to. GROSS: Yeah, on the way to the moon. Yes. Yes. GROSS: So it's a Les Baxter piece called "Lunar Rhapsody." GROSS: And what I find really interesting about this is that, you know - this comes under the category about - of a genre that's been described as exotica, but you know, this track has - it has like, if I may describe it this way, with all due respect to Neil Armstrong, like, Hollywood-style celestial voices, a theremin, this incredibly, like, florid piano. GROSS: It's like, in my opinion - and again, with all due respect - it's pretty schlocky. And having that kind of transcendent experience of, like, being on your way to the moon and playing this, like, really corny (laughter) version of what, you know, lunar might be - it just strikes me as so - it's just so strange. And - as somebody - I know how interested you are in music and how, like, you play music, so how did it strike you? CHAZELLE: I was fascinated by it, you know. It was another surprise among many, you know, that I sort of learned about when learning about Neil. It was actually a thing that Ryan himself had stumbled on. I mrsn, it's mentioned in Jim Hansen's book that Neil liked this track. And I think what's interesting about it is, you know, it's not just that the track itself is so florid or - you know, or so little known. There were also more famous tracks of music that that Neil and some of the other astronauts played during the course of their mission. They played a piece from - by Dvorak and whatnot. But this, you know, strange little Les Baxter tune was something that was actually - that Neil and Janet listened to together, that they loved together when they were young and in love and in college. So to me, what was interesting was that someone in space and as I learned, someone who was - you know, who was having - you know, going through a tough time on a family level and a marriage level would kind of unexpectedly play this track that really no one listening - no one in mission control, certainly, no one in the world overhearing - would have any real connection to except for the person he loved, except for Janet. That, actually, I found really moving and felt like another way of tying Earth to the moon, you know? - tying space and the sort of cosmos to, you know, those intimate behind-closed-doors moments between husband and wife. GROSS: OK, well, why don't we hear a little bit of the record that we've been talking about, which is called "Lunar Rhapsody"? GROSS: That's "Lunar Rhapsody," which Neil Armstrong played on the way to the moon, and it's used in the new movie "First Man," which is directed by my guest, Damien Chazelle, who also directed "La La Land" and wrote it, too, and also wrote and directed "Whiplash." Another thing I found remarkable was that you were working on "La La Land" before "First Man." But "La La Land" was in turnaround, so, like, you hadn't really begun shooting it, right? CHAZELLE: Yeah. I first met Ryan to talk to him about "First Man." And so, you know, that was, you know, a few years into "La La Land's" kind of languishing, you know, life. It was sort of, you know, just, you know - I'd been trying to get it made for a while and with no success and through a lot of stops and starts. And during that time, I made "Whiplash." And then during - or after that, I was given this book, "First Man" by Jim Hansen, and fell in love with it and went to Ryan and said, hey, would you be interested in playing Neil Armstrong? And he said, oh, that sounds really interesting and, oh, by the way, I also hear you're into musicals. You have a musical script. And I said, oh, yeah, you like musicals? He said, yeah, I love Gene Kelly. And we talked about Gene Kelly for a few hours. And suddenly, the next year and a half of our life was not "First Man," but "La La Land." But as soon as "La La Land" was done, you know, this project had been kind of simmering in the background. And we jumped right into this. GROSS: So finally, what brings you the most joy and the most anxiety in doing a movie like "First Man" - which - there's so much technical stuff you had to do, you know, with, like, sound effects and reproducing space capsules and space flight and creating, like, replicas in real size and then miniatures? It's - you know, "La La Land" was a complex film, but that's because of, like, the choreography and the camerawork and the dreamy sequences. This is, like, technically difficult in a whole other level. CHAZELLE: Yeah. I mean, I think everything you described gave me a lot of anxiety, a lot of sleepless nights. I think even more than that, you know, it was a little bit the responsibility, the weight of history. And I think particularly, knowing that - and Ryan has said something very similar, too - knowing that Neil's kids were going to see this film. You know, they'd been very helpful with us all through the making of it and helping us get it right. But knowing that at the end of the day, this was a film that they were going to see. And they weren't going to see a historical figure on screen, they were going to see their mom and their dad. They were going to see themselves. They were going to see their family life. It was just a kind of responsibility that, certainly, I hadn't felt before as a filmmaker. And I think it was a good fire. You know, it sort of lit a fire under myself and all of us to just go that much further, work that much harder to, you know, really get it right and pay proper tribute to these people. GROSS: Damien Chazelle, thank you so much for talking with us. It's been great to have you back on our show. And congratulations on the film. CHAZELLE: Thank you. So nice to be back, thanks for having me. GROSS: Damien Chazelle directed the new movie "First Man" and won an Oscar for directing "La La Land." After a break, Lloyd Schwartz will review Yo-Yo Ma's new recording of Bach cello suites. This is FRESH AIR. (SOUNDBITE OF JUSTIN HURWITZ'S "THE LANDING") Transcript provided by NPR, Copyright NPR.